This entry was posted in Community-Scale Solar, Nebraska / Midwest News, NewsBlog and tagged City of Scottsbluff, community solar development in Nebraska, GenPro Energy Solutions, Mesner Development Comapny, Nebraska Public Power District, Nebraskans for Solar, NPPD's SunWise Program, Scottsbluff Star Herald on April 5, 2017 by Helen Deffenbacher. One of Nebraska’s largest utilities is scheduled to meet with stakeholders today to begin developing a vision for its first community solar project. When Omaha Public Power District was soliciting feedback from customers a couple of years ago about its sources of generation, community solar “was one of the things our stakeholders always asked about,” said Laurie Zagurski, the utility’s manager of community outreach . . . Nebraskans for Solar generally supports community solar, and plans to send a representative to the meeting today to convey its thoughts about how community solar could be structured. It should, for one, result in an offset of energy or demand charges, and not take the form of “energy payments,” according to the group. “We really want it to be a program that is in the vein of what maybe nationally is recognized as a community-solar program, and not just a program given the name community solar and that maybe turns into a donation or request for money or something like that,” said Jared Friesen, an electrical engineer and the president of Nebraskans for Solar. Read more here. This entry was posted in Community Partners, Community-Scale Solar, Nebraska / Midwest News and tagged community solar development in Nebraska, Karen Uhlenhuth, Midwest Energy News, Nebraska's community-based solar energy development, Nebraskans for Solar, Nebraskans for Solar President Jared Friesen, NPPD's SunWise Program on March 23, 2017 by Helen Deffenbacher. The Kearney project, at $11 million and 5.8 megawatts, will be the largest solar array in Nebraska when its solar panels spanning 53 acres go online in the fall. 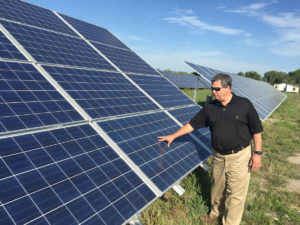 The Kearney project is among community solar projects that are flying off the drawing board as creative partnerships, technological advancements and other factors have turned solar into a cost-effective, long-term alternative among renewable energy sources. Read the entire article here. This entry was posted in Community-Scale Solar, Nebraska / Midwest News, NewsBlog and tagged community solar development in Nebraska, Kearney Hub, Kearney's community solar project, Mike Konz - Kearney Hub Managing Editor, Nebraskans for Solar, Tech oNE Crossing tech park in Kearney, The City of Kearney on February 23, 2017 by Helen Deffenbacher. First, residents and commercial consumers will be able to buy the solar energy, if powering their homes and businesses with green power is important to them. Second, and perhaps more important, the project will serve as a giant billboard for Kearney’s Tech oNE Crossing to aid in recruiting technology firms to the city’s tech park. Kearney lost the bid a few years ago for a $1 billion Facebook data center not because we offered sharply reduced electrical rates for the power-gobbling data center, but because the winning bid from Iowa included renewable wind energy. With an $11 million solar array in the works, Kearney is now a player in the technology recruitment game. Third, the city, school district, county and other taxing entities will get a bump in their tax draws as the solar array and new tech firms fill the Tech oNE park. Facebook is one of 65 signatories to the Corporate Renewable Energy Buyers’ Principles. 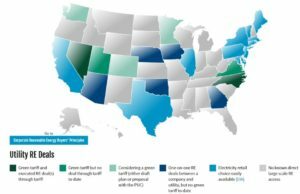 Corporate Buyers’ Principles signatories need to buy nearly 44 million megawatt hours of renewable energy across the US by 2020. States that offer products can compete for this economic development and these companies more effectively. The Corporate Renewable Strategy Map shows where large energy buyers can access the renewable energy they want at the scale they need. 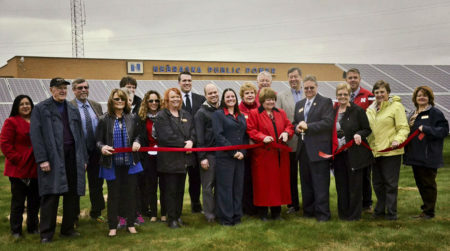 This entry was posted in Community-Scale Solar, Nebraska / Midwest News, NewsBlog and tagged community solar development in Nebraska, Corporate Renewable Energy Buyers' Principles, corporate renewable energy procurement, Kearney Hub, Kearney's community solar project, Kearney's Tech oNE Park on January 27, 2017 by Helen Deffenbacher. Once finished, there will be five rows of panels, with approximately 500 panels. GenPro hopes to be finished installing the panels in two to three days. The solar project is the first of its kind in the Panhandle . . . The 128-kilowatt solar array is a step toward the future for NPPD as it looks to remain competitive and provide customers with renewable energy. Read the entire article here. Additional resources for Nebraska Cities & Towns Interested in Developing a Community Solar Project. Click link and scroll down. Nebraska Legislative Bill 610: Adopt the Community Solar Energy Economic Development Act. Introduced by Senator Rick Kolowski January 18, 2017. Referred to the Natural Resources Committee January 20, 2017. Nebraska Legislative Bill 626: Adopt the Shared Community Solar Act. Introduced by Senator Tyson Larson of O’Neill on January 18, 2017. Referred to the Natural Resources Committee January 20, 2017. LB626 would authorize the establishment of guidelines, including the participation, regulation and financing of community solar projects. 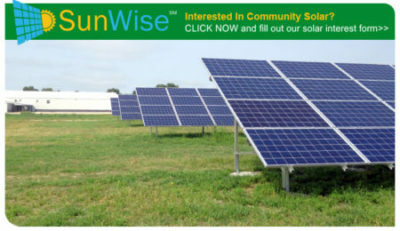 This entry was posted in Community-Scale Solar, Nebraska / Midwest News, NewsBlog and tagged 2017 Nebraska Community Solar Legislation, community solar development in Nebraska, Nebraska Legislative Bill 610, Nebraska Legislative Bill 626, SunWise - NPPD's Pilot Community Solar Program on January 20, 2017 by Helen Deffenbacher. Photo: Nebraska’s first community solar project in Central City. Community Solar Policy Decision Matrix: Guidance for Designing Community Solar Programs. Download it here. This entry was posted in Community-Scale Solar, Nebraska / Midwest News, NewsBlog and tagged community solar development in Nebraska, Nebraska solar farms, Nebraska solar gardens, Nebraska's community solar development, Nebraskans for Solar on January 13, 2017 by Helen Deffenbacher. Scottsbluff, Neb. 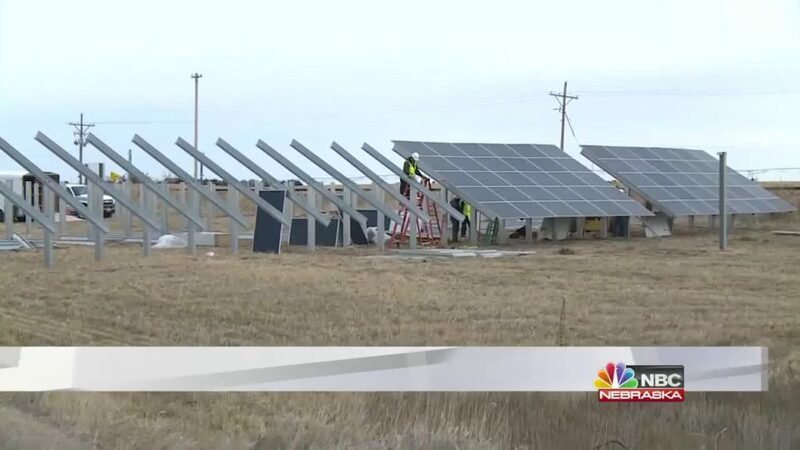 – If you were wondering when the new community solar project in Scottsbluff at the Nebraska Public Power District office was going to be installed . . . it’s still coming. Arlt indicated that construction is expected to begin in the next week, and is expected to be completed by the end of the month. Of the solar shares made available to the community, all 135 have been sold and accounted for, although NPPD would continue taking names to be placed on a waiting list. “We had positive feedback from customers in Scottsbluff from the beginning and they showed their interest by becoming part of this community solar project,” Arlt added. While that construction begins soon, drivers are urged to be cautious driving along the construction site in front of the NPPD Operations Center at the intersection of Belt Line Highway and First Avenue. Link to NPPD’s Newsroom. This entry was posted in Community-Scale Solar, Nebraska / Midwest News, NewsBlog and tagged community solar development in Nebraska, Midwest community solar development, Nebraska Public Power District (NPPD), Nebraskans for Solar, NPPD Retail General Manager Tim Arlt, SunWise - NPPD's Pilot Community Solar Program, Venango & Scottsbluff solar gardens on January 10, 2017 by Helen Deffenbacher. Click image to watch the newscast or read the post by KNOP News2. Photo: Venango homes and businesses have the opportunity to purchase up to ten 150-kilowatt shares of the solar garden for $2.17 each, with 108 total shares available. 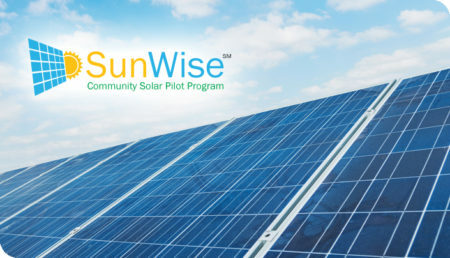 For more information about the pilot community solar project, click here. 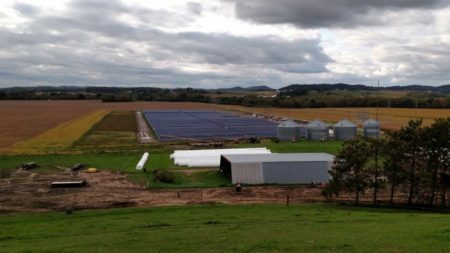 This entry was posted in Community-Scale Solar, Nebraska / Midwest News, NewsBlog and tagged community solar development in Nebraska, Developer Cliff Mesner, KNOP News, Nebraskans for Solar, SunWise - NPPD's Pilot Community Solar Program, Venango's Solar Garden on December 15, 2016 by Helen Deffenbacher. The western Nebraska village of Venango will soon have access to solar power. The Venango Community Solar Project will host a groundbreaking ceremony just northeast of the village at 3:30 p.m. MST Wednesday, with an open house from 4 to 6 p.m. at the Tin Can Diner, 116 N. Pennsylvania Ave. At the open house, potential customers will learn about solar power and its uses. Continue reading. Photo: Developer Cliff Mesner at Central City’s solar garden, Nebraska’s first community solar project. This entry was posted in Community-Scale Solar, NewsBlog and tagged community solar development in Nebraska, Developer Cliff Mesner, Nebraskans for Solar, NPPD's pilot community solar program - SunWise, Venango's Solar Garden on December 14, 2016 by Helen Deffenbacher. The village of Venango owns its own electrical distribution system and leases it to NPPD, who operates it on behalf of the village. In return, NPPD returns 12 percent of the revenues to the village. [Tim Arlt, general manager of retail sales for NPPD] said this project puts Venango on the cutting edge in Nebraska. Both the Venango [96 kWs] and Scottsbluff projects are set to come online in January so the race is on to see which one will be NPPD’s first-ever solar project to go live. The Scottsbluff project will generate 128 kWs. The much bigger Kearney project, which will generate 5.7 megawatts, is slated to come online in July 2017. This entry was posted in Community-Scale Solar, Nebraska / Midwest News, NewsBlog and tagged community solar development in Nebraska, Kearney solar project, NPPD's SunWise Program, Russ Pankonin, Scottsbluff solar project, The Imperial Republican, Venango solar project on December 9, 2016 by Helen Deffenbacher.